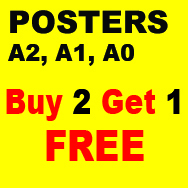 Design your own A2 & A1 Large Format Posters in 3 simple steps. You have the option to collect the posters in-store, or have them delivered to your door. High quality 195gsm satin posters at very affordable prices! A2 A1 and A0 are now 3 for the price of 2 until 31st December 2016 - Just order online and contact the store (Here) you`d like to collect from to get the discount. .